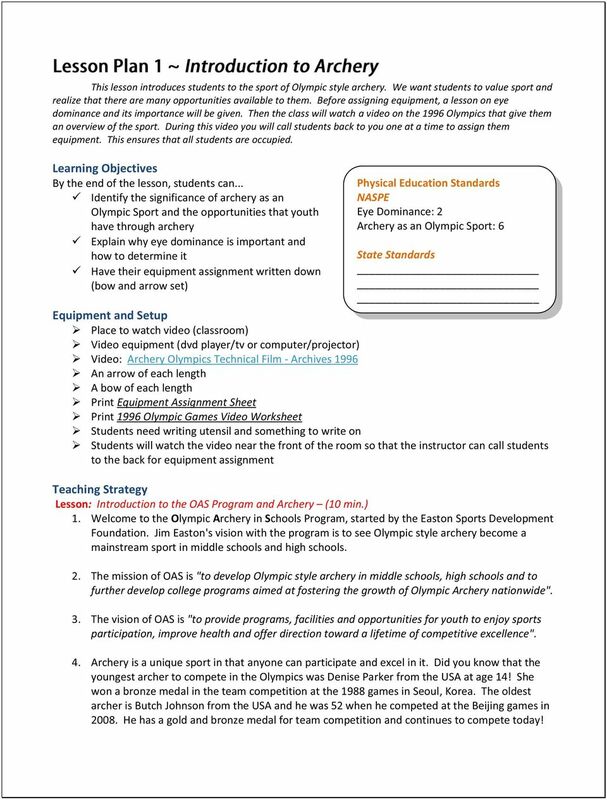 Download "Physical Educators Guide for Olympic Archery in Schools"
5 Olympic Archery in Schools Course Syllabus Title: Beginning Olympic Style Archery Instructor: Grade Level: School: Instructional Materials: Form straps, stretch bands, archery equipment, OAS Curriculum, OAS website resources, video Lessons and Activities Lesson 1 ~ Introduction to Archery Introduce Olympic Style Archery Eye Dominance Equipment Assignment Lesson 2 ~ Fundamentals First Archery Safety Concept and practice of Holding Lesson 3 ~ Taking Baby Steps Bow arm elbow rotation Steps of the National Training System GAME 1 Bow arm holds Lesson 4 ~ Tidying Up Principle of eye control Importance of training aids Focus on Holding, posture, shoulder positions, and bow arm alignment Brief Summary Students are introduced to the OAS Program and archery as an Olympic Sport. They will learn how to determine their eye dominance and discuss why it is important. Then they will watch a video on the 1996 Olympic Games to get an overview of archery competition. During that time equipment assignments will be given. 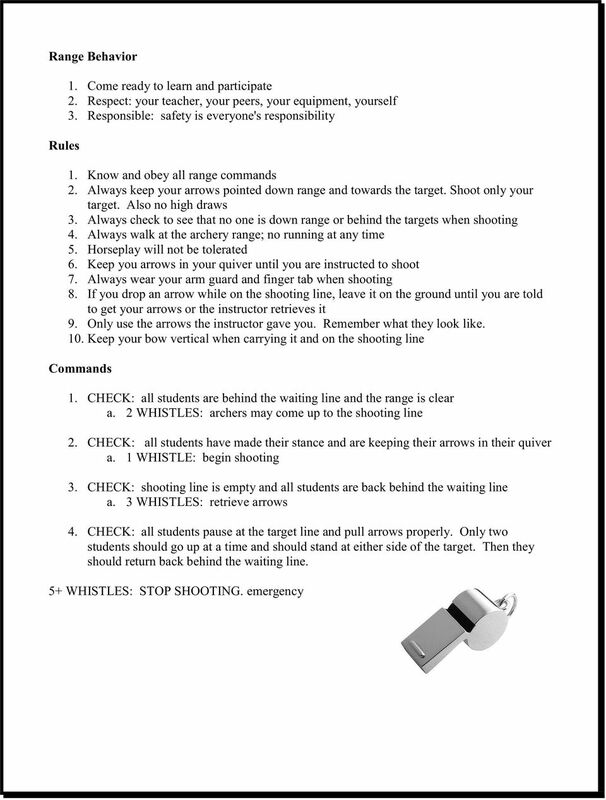 Behavior on the archery range, range rules, and range commands will be discussed and practiced. Then they will learn the concept of Holding and do the squeeze drill in groups. Students will learn how to properly rotate the bow arm elbow. Then they will go through the steps of the National Training System with form straps. Groups will help lead the class. The class is split in half. One half does the bow arm hold with good alignment and the other out-of alignment. The groups compete to see who can hold it the longest. Purpose is to understand how our bone structure is used. The principle of eye control is a neat way to see how a small thing like eye position can affect the rest of our body. Thus training aids are important for proper practice. Use training aids and various drills to reinforce holding, posture, shoulder positions, and bow arm alignment. 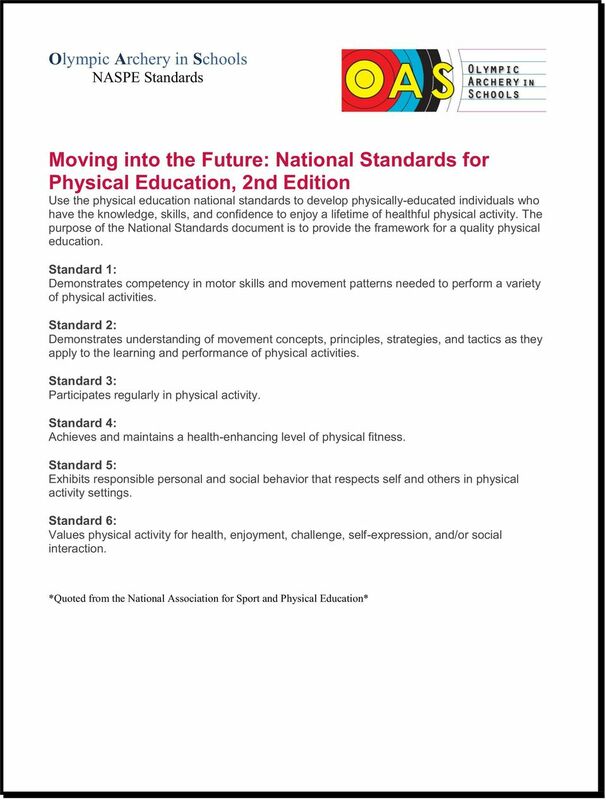 GAME 2 Simon Says Play Simon Says to review the steps of NTS. 6 Lesson 5 ~ Dress Rehearsal Practicing form and range commands/safety together Archery Equipment (parts and use) Students will practice with form straps and stretch bands while also obeying the range commands to simulate an actual practice session. Then they will learn about the archery equipment and its proper use. 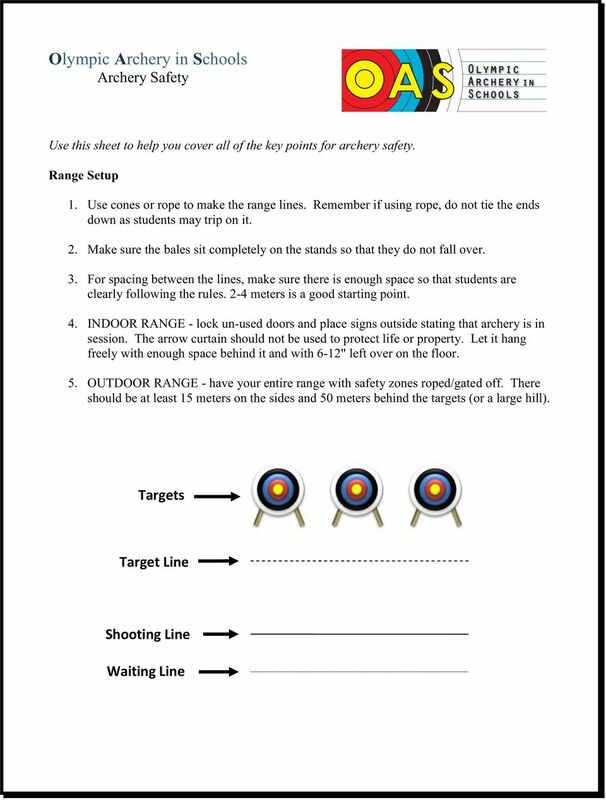 QUIZ Archery Safety Holding Steps of NTS Lesson 6 ~ Give it a shot! Practice with a bow at blank bale Lesson 7 ~ Application Focus on Holding, posture, shoulder positions, and bow arm alignment with a bow Lesson 8 ~ Shot Execution Re-visit release & follow-through with bow Students will practice with a bow at blank bale. Students have a worksheet to complete as they do different stations. Practice with a bow while focusing on Holding, posture, shoulder positions, and bow arm alignment. Peers will evaluate each other to provide feedback. Use training aids and various drills to work on release and follow-through while practicing with a bow. MIDTERM Covers lessons 1-8 GAME 3 Balloon shoot Balloons are a fun way to practice form without the distractions of scoring or over-aiming. Lesson 9 ~ Put Your Back Into It! Back-tension and scapula movement Challenge students to feel back tension and expand their sense of body awareness. 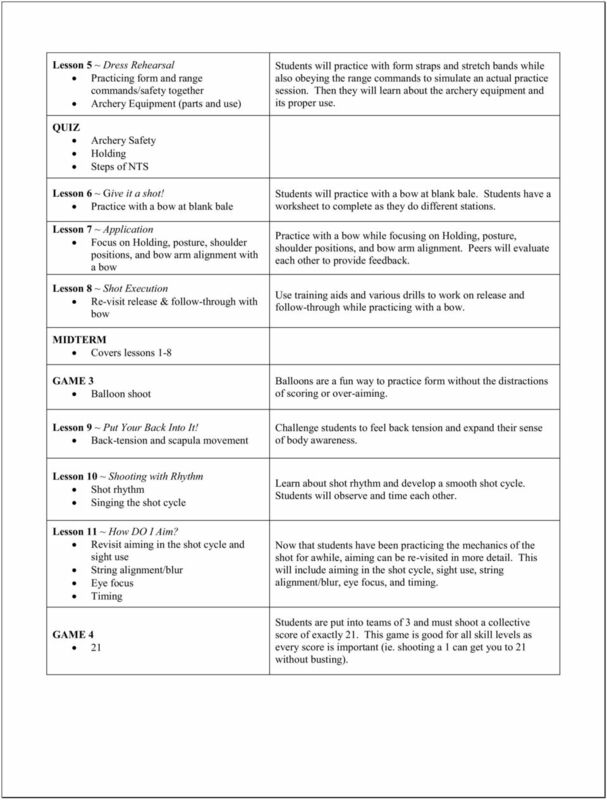 Lesson 10 ~ Shooting with Rhythm Shot rhythm Singing the shot cycle Lesson 11 ~ How DO I Aim? Revisit aiming in the shot cycle and sight use String alignment/blur Eye focus Timing GAME 4 21 Learn about shot rhythm and develop a smooth shot cycle. Students will observe and time each other. Now that students have been practicing the mechanics of the shot for awhile, aiming can be re-visited in more detail. This will include aiming in the shot cycle, sight use, string alignment/blur, eye focus, and timing. 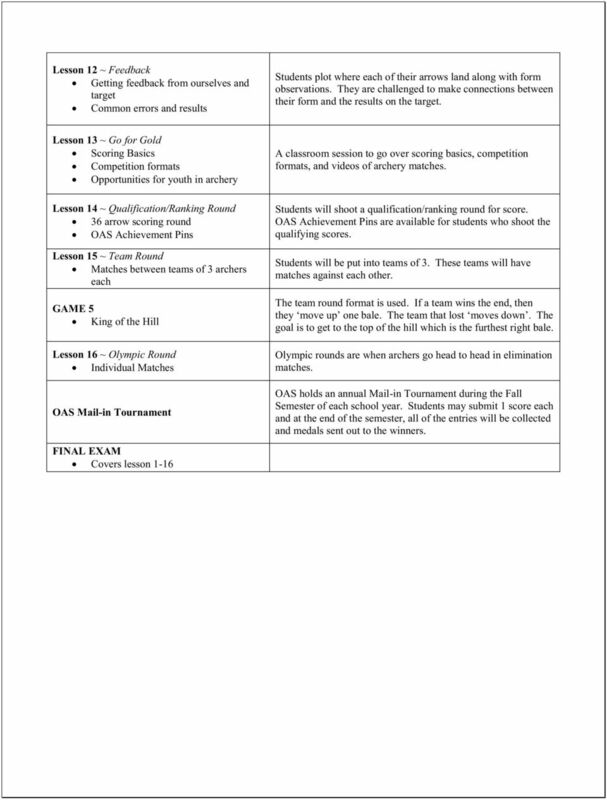 Students are put into teams of 3 and must shoot a collective score of exactly 21. This game is good for all skill levels as every score is important (ie. shooting a 1 can get you to 21 without busting). 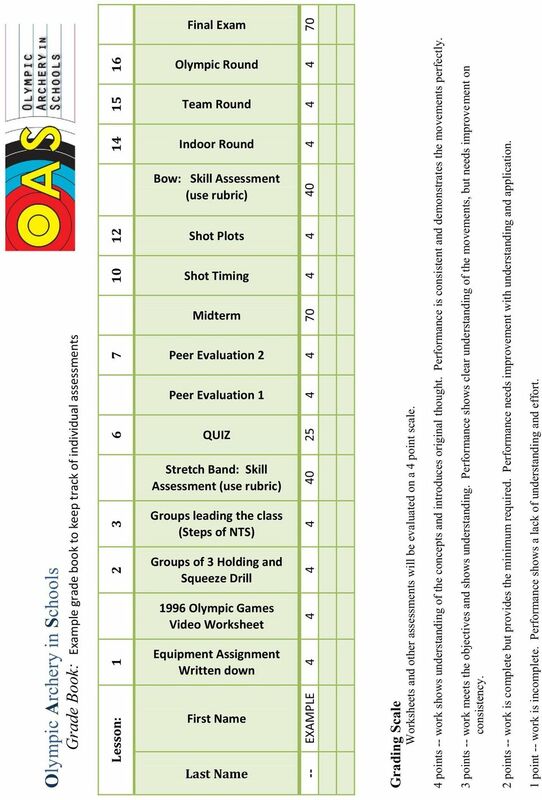 9 Olympic Archery in Schools Skills Assessment Rubric: Beginning Archery Skill assessments should be done with both stretch bands and bows. Many times students understand the concepts and are able to demonstrate them with a training aid, but need more practice to be able to do it with a bow. Rating Stance Places feet into correct position consistently (one foot on either side of shooting line, parallel, shoulder width apart). Consistently does 2/3 key points for stance (one foot on either side of shooting line, parallel, shoulder width apart). Places one foot on either side of the shooting line, but with incorrect positions (ie. feet spread open instead of parallel). Forgets to do stance and places feet in incorrect place (ie. two feet on one side of shooting line) and position. Posture Set Setup Able to do 3 steps to good posture and maintain it consistently during entire shot. Does correct hook and grip as well as bow arm elbow rotation. Also brings bow arm and draw arm to correct positions (bow arm slightly out in front and draw hand by stomach area). Barrel of the gun is set at Setup. Both shoulders remain down and draw hand is about cheek height. Able to perform the 3 steps, but needs a little improvement when practicing shot (ie. starts with good posture, but hollow back when Loading). Hook, grip, elbow rotation, and set position are all generally correct and only need slight adjustments and reminders. Able to keep shoulders down or get bow arm alignment. Needs to work on one or other to get the proper draw side position. Able to do the 3 steps to good posture, but has a hollow back during practice of shot. Grip and hook is partially correct, but needs adjustments. Remembers to turn bow arm elbow and that there is a Set position, but does not know where to position arms. Knows the proper setup position, but needs assistance to get into the proper position. Does not know the 3 steps to good posture and has a hollow back. Incorrect grip and hook. Forgets to turn bow arm elbow. Bow arm and draw arm positions incorrect. Skips the Setup position and the barrel of the gun is not set (bow arm alignment). Shoulders come up and draw side is positioned incorrectly. Load Loads back muscles by moving LAN 2 (draw side unit) around. Draw hand comes 1-2" below chin and draw elbow is back around arrow line. Feels back tension when loading and is able to get the draw elbow towards the arrow line. Needs practice to get exact position. Understands how to do a proper load but cannot feel back tension. Movement needs practice in order to get draw elbow around more. Draws straight back to anchor and draw elbow is way outside of the arrow line. Concept of back tension or scapula movement is not understood. Anchor String makes contact with the nose, lips, and chin. The draw hand has solid bone to bone contact along jaw line. Able to get string and draw hand contact against face consistently. Needs adjustments to get exact position. Able to get string or hand to touch the face, but has inconsistent anchor points. Anchor is inconsistent and archer does not know what reference points to use (string and draw hand touches face). Transfer Draw elbow continues around after anchor to complete the archer's alignment. This is a small movement that allows the archer to take Holding. Does transfer in their shot cycle, but needs adjusting to get it to be the proper motion (ie. moves draw elbow up instead of around). Understands what transfer is but has difficulty applying it to their shot. Does not remember to do transfer and does not understand what it is. Holding Archer takes Holding both physically and mentally. Understands the importance of Holding and how the bone structure is used. Archer understands the concept and importance of Holding. Needs more practice to fully achieve Holding, but is making the proper motions to get there. Knows what the concept of Holding is, but does not know how to apply it in their shot. Archer does not take Holding. Nor do they know what Holding is or why it is important. Release Archer relaxes draw fingers to release while maintaining back tension. Release leads directly to follow-through and fingers remain curled and relaxed. Release is consistent, but still has slight tension in draw hand. Knows to relax fingers, but fingers remain straight after release. Actively opens fingers to release the string. Followthrough Tension and direction are maintained. Bow arm stays up, LAN 2 (draw side unit) continues around, and back tension is maintained. Eye focus is maintained on the target until the end of the shot. Archer understands how to follow-through with both the bow arm and draw side. Practice is needed to get movements. Knows how to do the followthrough, but only able to do one or the other (bow arm or draw side). Does not follow through (ie. releases and immediately starts the next shot). 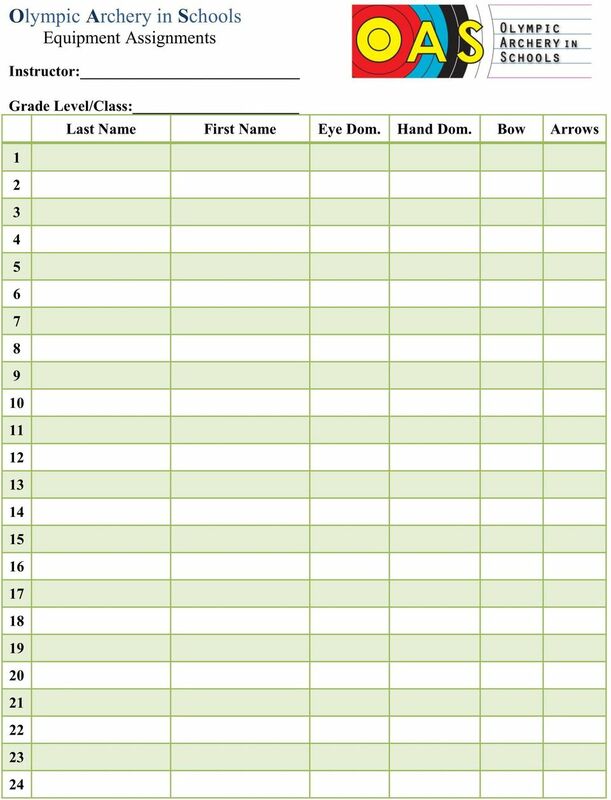 10 Olympic Archery in Schools Grade Book: Example grade book to keep track of individual assessments Lesson: Final Exam Olympic Round Team Round Indoor Round Bow: Skill Assessment (use rubric) Shot Plots Shot Timing Midterm Peer Evaluation 2 Peer Evaluation 1 QUIZ Stretch Band: Skill Assessment (use rubric) Groups leading the class (Steps of NTS) Groups of 3 Holding and Squeeze Drill 1996 Olympic Games Video Worksheet Equipment Assignment Written down First Name Last Name -- EXAMPLE Grading Scale Worksheets and other assessments will be evaluated on a 4 point scale. 4 points -- work shows understanding of the concepts and introduces original thought. Performance is consistent and demonstrates the movements perfectly. 3 points -- work meets the objectives and shows understanding. Performance shows clear understanding of the movements, but needs improvement on consistency. 2 points -- work is complete but provides the minimum required. Performance needs improvement with understanding and application. 1 point -- work is incomplete. Performance shows a lack of understanding and effort. 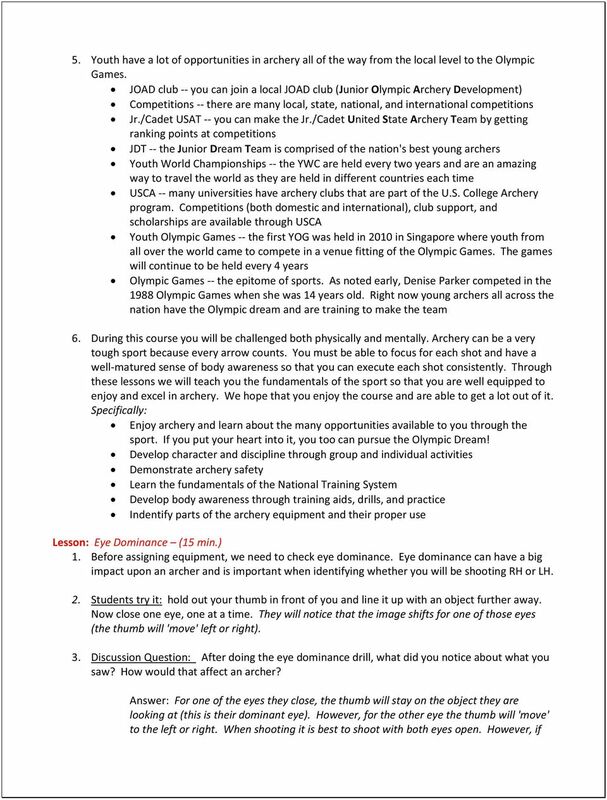 11 This lesson introduces students to the sport of Olympic style archery. We want students to value sport and realize that there are many opportunities available to them. Before assigning equipment, a lesson on eye dominance and its importance will be given. Then the class will watch a video on the 1996 Olympics that give them an overview of the sport. During this video you will call students back to you one at a time to assign them equipment. This ensures that all students are occupied. Learning Objectives By the end of the lesson, students can... Identify the significance of archery as an Olympic Sport and the opportunities that youth have through archery Explain why eye dominance is important and how to determine it Have their equipment assignment written down (bow and arrow set) Physical Education Standards NASPE Eye Dominance: 2 Archery as an Olympic Sport: 6 State Standards Equipment and Setup Place to watch video (classroom) Video equipment (dvd player/tv or computer/projector) Video: Archery Olympics Technical Film - Archives 1996 An arrow of each length A bow of each length Print Equipment Assignment Sheet Print 1996 Olympic Games Video Worksheet Students need writing utensil and something to write on Students will watch the video near the front of the room so that the instructor can call students to the back for equipment assignment Teaching Strategy Lesson: Introduction to the OAS Program and Archery (10 min.) 1. 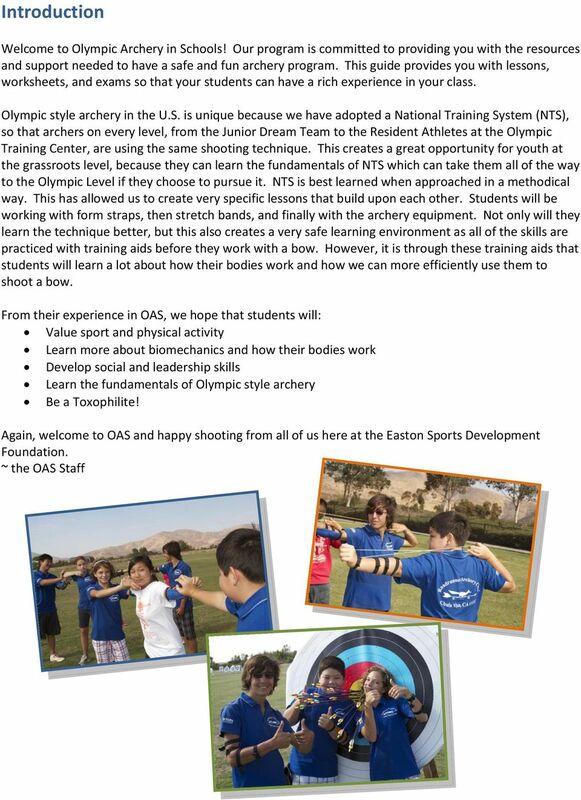 Welcome to the Olympic Archery in Schools Program, started by the Easton Sports Development Foundation. Jim Easton's vision with the program is to see Olympic style archery become a mainstream sport in middle schools and high schools. 2. 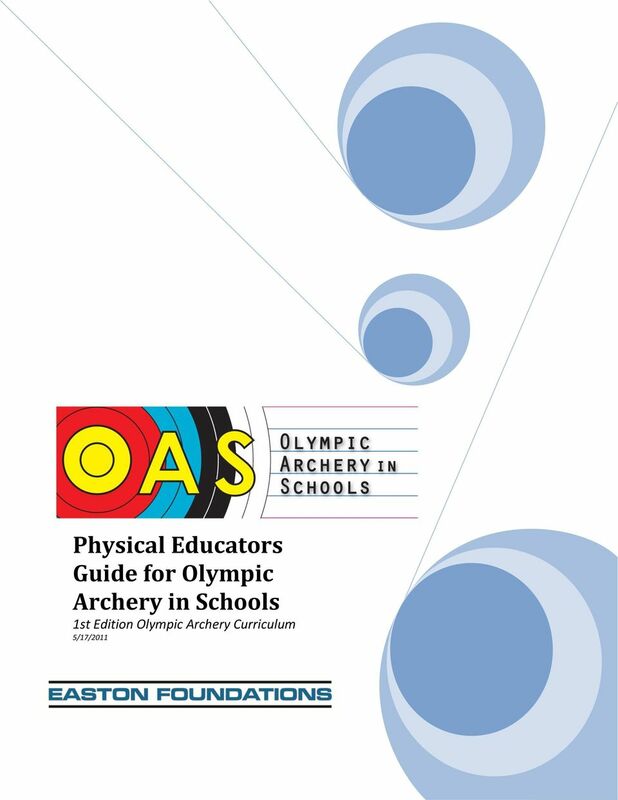 The mission of OAS is "to develop Olympic style archery in middle schools, high schools and to further develop college programs aimed at fostering the growth of Olympic Archery nationwide". 3. The vision of OAS is "to provide programs, facilities and opportunities for youth to enjoy sports participation, improve health and offer direction toward a lifetime of competitive excellence". 4. Archery is a unique sport in that anyone can participate and excel in it. Did you know that the youngest archer to compete in the Olympics was Denise Parker from the USA at age 14! She won a bronze medal in the team competition at the 1988 games in Seoul, Korea. The oldest archer is Butch Johnson from the USA and he was 52 when he competed at the Beijing games in He has a gold and bronze medal for team competition and continues to compete today! 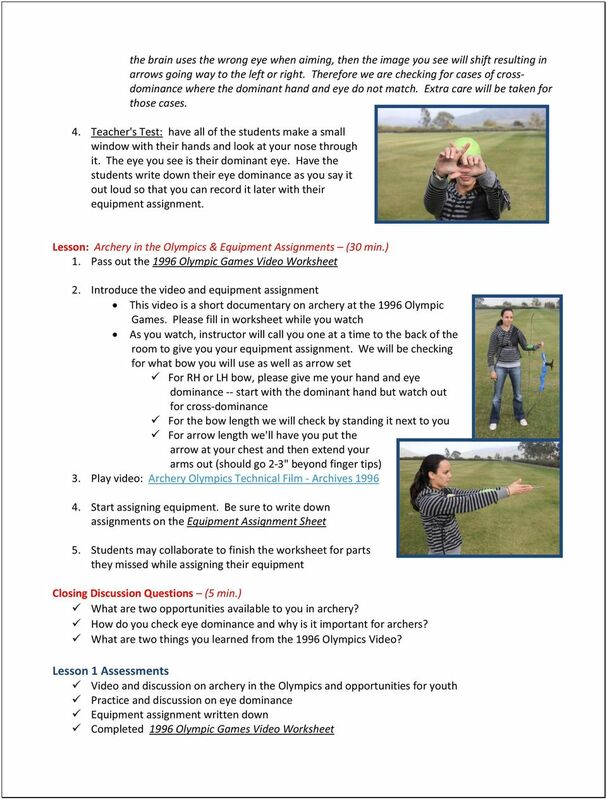 15 Olympic Archery in Schools 1996 Olympic Games Video Worksheet Name: Complete this worksheet as you watch the video on the 1996 Olympic Games. During this video, your teacher will call you back for your equipment assignment. At the end you may work with your peers to complete any sections that you missed. 1. How many countries participated in these games? 2. How many days of competition does the archery event last? 3. How many competitors in the men's division? 4. How many competitors in the women's division? 5. At which games did archery become part of the Olympic Program? 6. Why was archery then discontinued from the Olympics after 1920? 7. What year and games did archery return to the Olympics? 8. How many arrows are shot to determine rankings? 9. How far are the archers shooting? 10. How are ties decided? 11. Who won the gold in the individual women's division? 12. Who won the gold in the individual men's division? 13. For team rounds, how many archers are there per team? 14. Which team won the women's team competition? 15. Which team won the men's team competition? 20 This lesson goes over bow arm elbow rotation and introduces the steps of NTS. Students will learn ways to practice their elbow rotation and be able to self-check themselves. To go over the steps of NTS, have the students follow along with form straps. Focus on the movements and positions. Groups of students will help you lead the class while you coach. Learning Objectives By the end of the lesson, students can... Demonstrate bow arm elbow rotation and explain why it is important Say the steps of NTS in their proper order with help from their peers Roughly demonstrate the positions and movements of NTS with a form strap Equipment and Setup Empty space (room or field) Form Straps Print Steps of NTS sheet Physical Education Standards NASPE Bow arm elbow rotation: 1, 2 Steps of NTS (student leadership and cooperation): 1, 2, 3, 4, 5, 6 State Standards Teaching Strategy Review Questions: Safety and Holding (10 min.) 1. How should we behave on the archery range? 2. What are our range rules? 3. 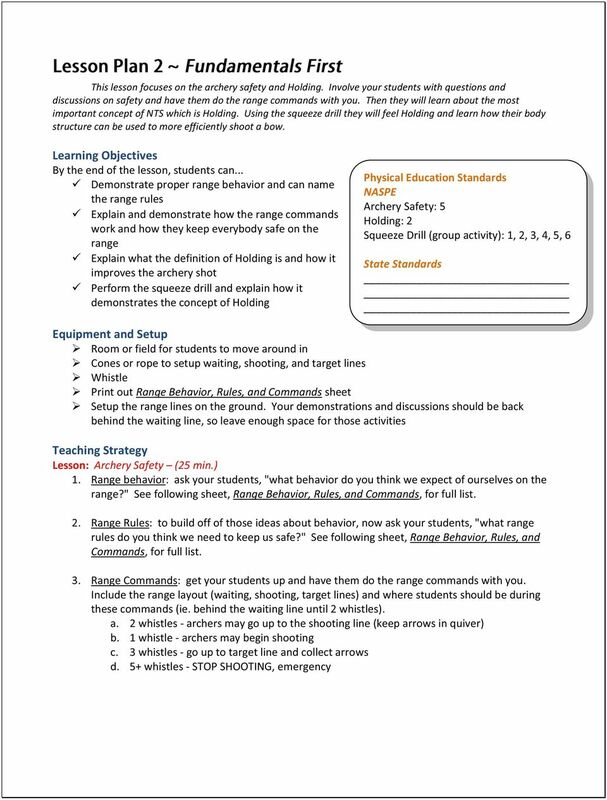 Range Commands: have students walk you through range commands as you do them 4. What does NTS stand for and what is the most important part of NTS? 5. What is Holding? Why is it important? 6. 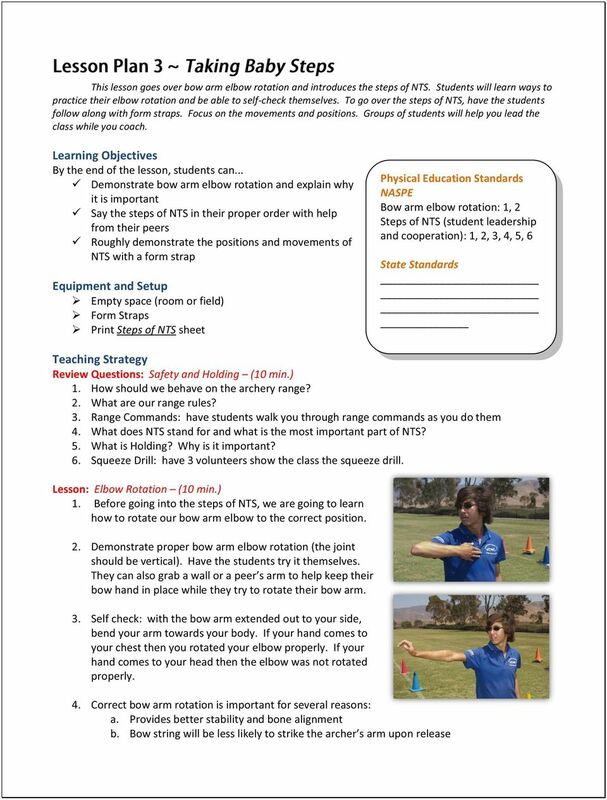 Squeeze Drill: have 3 volunteers show the class the squeeze drill. Lesson: Elbow Rotation (10 min.) 1. Before going into the steps of NTS, we are going to learn how to rotate our bow arm elbow to the correct position. 2. Demonstrate proper bow arm elbow rotation (the joint should be vertical). Have the students try it themselves. bow hand in place while they try to rotate their bow arm. 3. Self check: with the bow arm extended out to your side, bend your arm towards your body. If your hand comes to your chest then you rotated your elbow properly. If your hand comes to your head then the elbow was not rotated properly. 4. Correct bow arm rotation is important for several reasons: a. Provides better stability and bone alignment b. 22 Olympic Archery in Schools Steps of NTS Intro to NTS: this sheet outlines several key points for each step of the National Training System 1) Stance One foot on either side of the shooting line Shoulder width apart Parallel Hook and grip go here 2) Posture Straight back (hollow back is bad) 3 steps: o tuck hips under o chest down o settle weight down into hips 3) Set Extend bow arm out in front (just to the right) Rotate bow arm elbow Draw hand by stomach with wrist bent out slightly Set head towards target 4) Setup Bow arm raises up Bow arm in line with back Draw hand raises straight up to cheek height and back by the arm pit Keep both shoulders down! 24 Olympic Archery in Schools GAME 1 ~ Bow Arm Planks This game shows students the advantage to having proper bow arm alignment NASPE: 1, 2, 3, 4, 5, 6 Procedure 1. Split the class into two groups. 2. One group will do the Bow Arm Planks with good alignment (relax and let bone structure hold the weight) while the other half does it out of line. 3. The challenge is to see which group can hold that position the longest. Closing Discussion Questions 1. Why would bone structure be important in archery? a. Using your bone structure means that less muscles have to be used. This is also a stronger position and less prone to collapses. When more muscles are used it is easier for the shot to collapse and for the shot to go off center. 2. 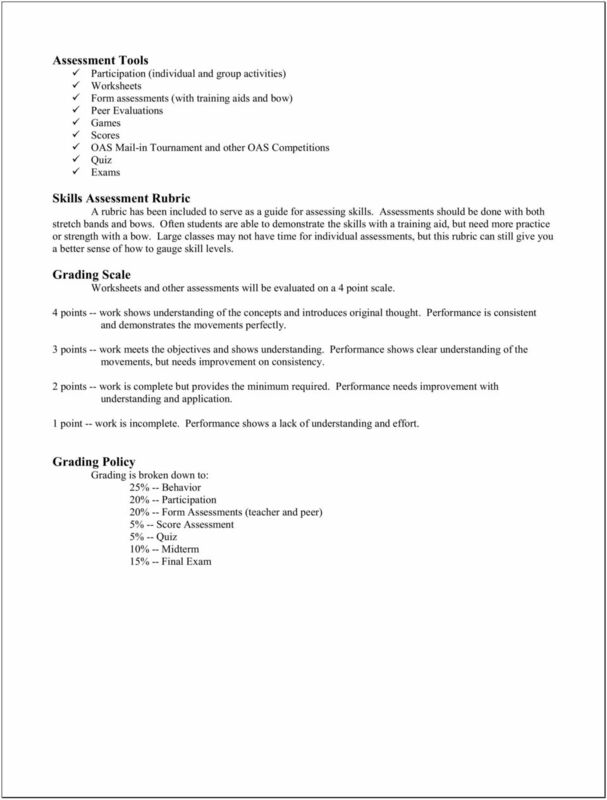 Why is this important during competitions? a. During competitions it is easy to get nervous and for the heart rate to go up. By taking Holding and getting this bone alignment, the archer can relax more which makes for a more calm and controlled shot. 25 The Principle of Eye Control is a neat activity to get students interested, especially during this time of practice with training aids. It shows students how complex our bodies are and why training aids are essential. Students will continue to learn more about biomechanics by doing posture and alignment drills. Focus on having students experience these concepts and feeling why concepts are important. Learning Objectives By the end of the lesson, students can... Demonstrate the principle of eye control Explain why training aids are important Demonstrate the 3 steps to good posture and explain why it is important Demonstrate proper bow arm alignment and shoulder position as well as explain how this proper alignment affects archers Equipment and Setup Open space (gym or field) Form straps Stretch bands Print GAME 1: Bow Arm Planks sheet Physical Education Standards NASPE Principle of Eye Control: 2, 5, 6 Posture: 1, 2 Bow arm alignment: 1, 2, 3, 4, 5, 6 State Standards Teaching Strategy Lesson: Principle of Eye Control (10 min.) 1. Today we are focusing on biomechanics and understanding how to properly set up our body to make the best shots we can. To start, we have a neat activity about the Principle of Eye Control. 2. Demonstrate with a volunteer. Have the student face you and stick their arms out to their sides. Now gently try to push their arms down (push down from the wrists) while they try to keep them up. Next, keep their head facing you and have them look out of the corners of their eyes. Again push down on their arms, but this time they will find it very difficult to keep them up. 3. Students try it: have them pair up to try it with each other 4. This drill teaches us two things: a. If a tiny thing like eye position can have a big impact upon the rest of our body, what about our posture, scapula movement, or the muscles we use? This is why training aids are so important. Archery is especially challenging because it involves a lot of body awareness and control. We need these training aids to help us understand how our body works and to train it to perform these movements with a high level of control. b. In terms of archery, the Principle of Eye Control shows how important head position is. If the head is set at in an awkward position that has us looking out of the corners of our eyes, then that will affect the rest of our body. 26 Lesson: 3 Steps to good posture (10 min.) 1. Question: What is the second step of NTS? (posture) 2. Use a volunteer to show the 3 steps to good posture a. Tuck hips under b. Chest down c. Settle weight down into hips 3. Good posture allows us to be more stable and use our core muscles. If the 3 steps to good posture are not taken, then archers typically end up with a hollow back 4. Students try the 3 steps together GAME 1: Bow Arm Planks (10 min.) 1. For our next topic, bow arm alignment, we are going to play a game. 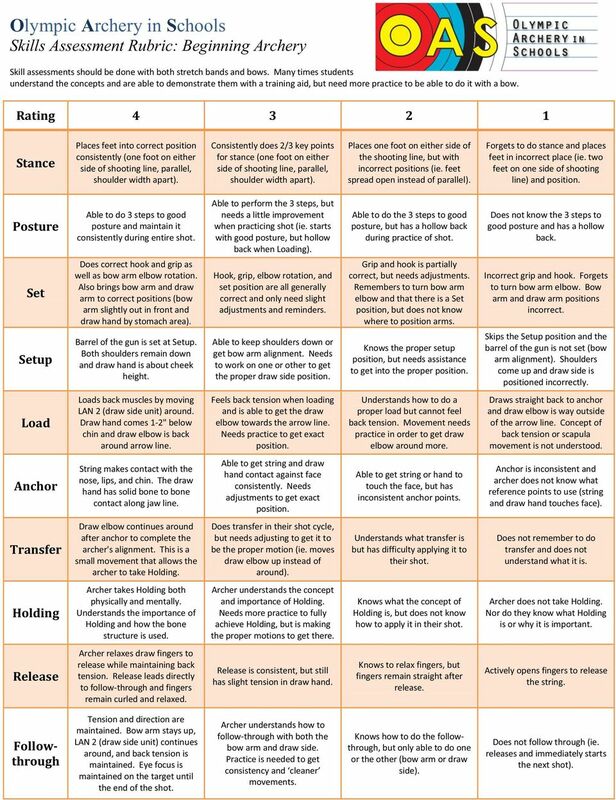 See GAME 1: Bow Arm Planks sheet. 2. 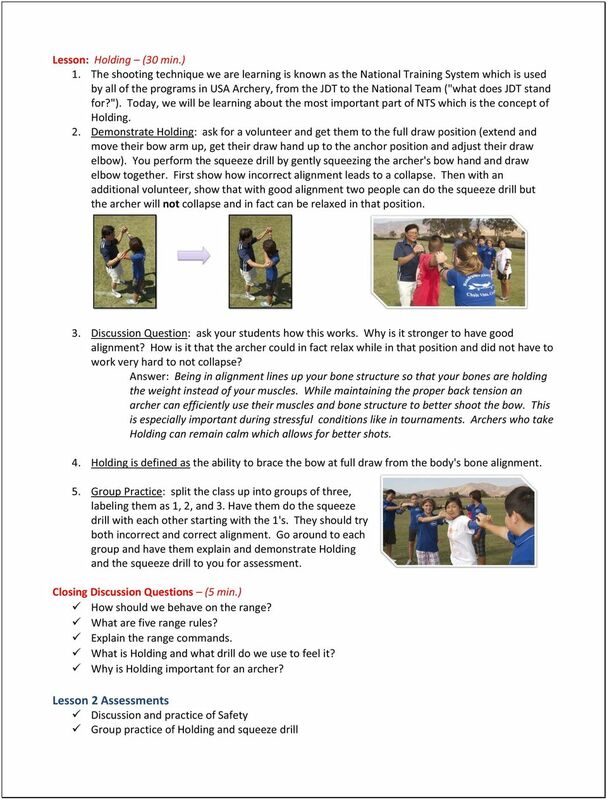 Discussion: See discussion questions on GAME 1: Bow Arm Planks sheet Lesson: Bow shoulder and bow arm/shoulder alignment (barrel of the gun) (20 min.) 1. It is crucial that both shoulders stay down and that the bow arm is in line with the back. These two components are important for getting to Holding and getting that biomechanical advantage from proper bone alignment. 2. Alignment Drill: use the stretch band to practice bow arm alignment. Pull the stretch band behind your head while extending your bow arm out to your side. This helps you feel the proper bow arm and shoulder position. Then bring your draw hand over your head to the load position while keep the bow arm in place. Finally bring the draw hand to the setup position. From setup to the finish of the shot, the bow arm should maintain its alignment. 3. Have the students practice this drill by calling out the positions: behind the head, load, setup Practice: Quick practice review (5 min.) 1. Practice the steps of NTS with stretch bands Closing Discussion Questions (5 min.) Why is this practice with training aids so important? What are the 3 steps to good posture? How should my bow arm and shoulder be positioned? What are the steps of NTS in their proper order? 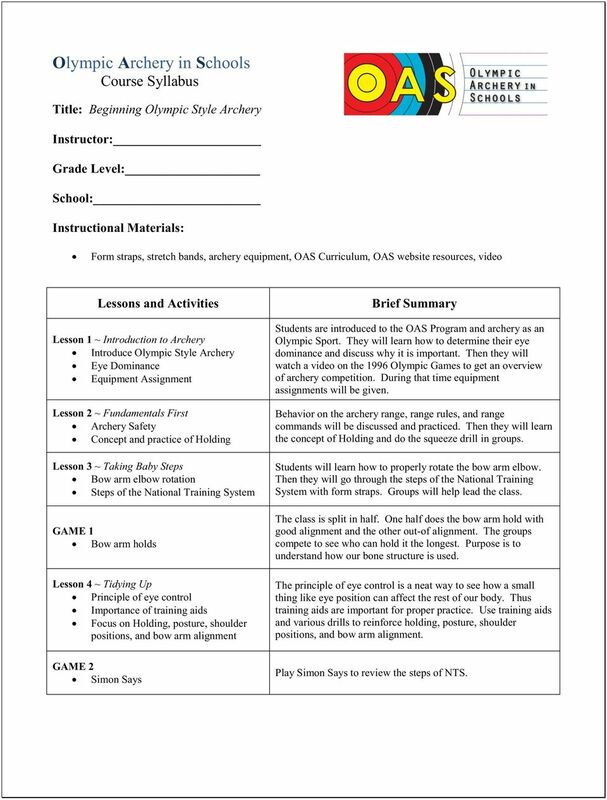 28 Olympic Archery in Schools GAME 2 ~ Simon Says Play a game of Simon Says to review the steps of NTS. If a student gets out (moves when you didn't say "Simon Says...") then they will help you watch the remaining students. 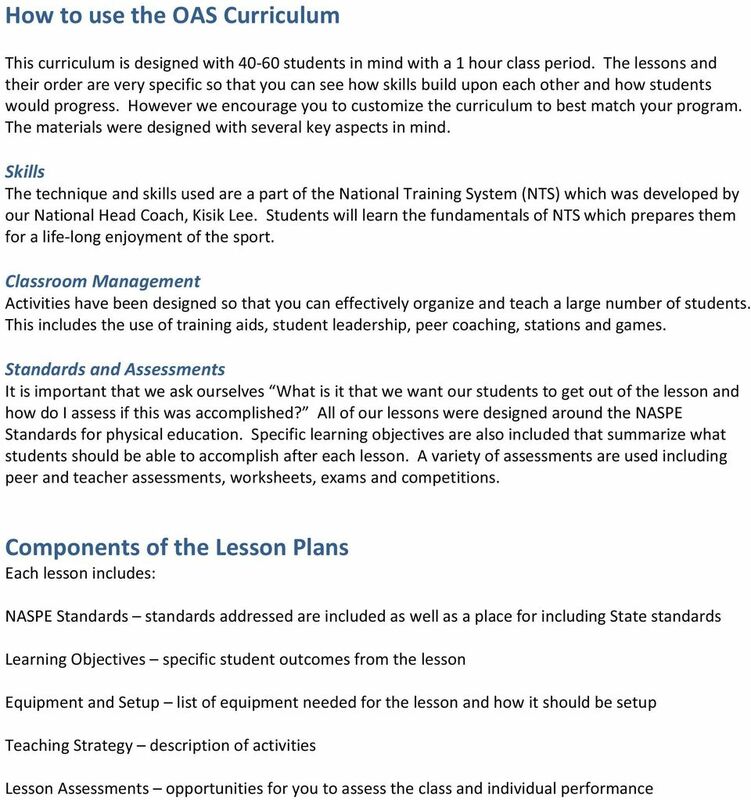 NASPE: 1, 2, 5, 6 Procedure 1. Have all of the students stand on the waiting line with their stretch bands. 2. Start with "Simon says...stance". Then do posture and set. 3. Continue with a mix of the steps. Release is an especially fun one to get students on as you will hear the stretch band if they accidently release it. Closing Discussion Questions 1. Along with the name of each step, can you associate a feeling with it too now? What are ways that we know our body is at the correct position? (ie. at Load I feel my right scapula, or at anchor I can feel my knuckle bone press against my jaw bone) 2. When you throw a ball what do you think about? Eventually the goal is to not have to think about these individual steps because they will be in your muscle memory. What are ways that we can develop muscle memory? 32 Equipment Use 1. Remember range rules - Arrow should be in quiver until told to shoot and bow should always be pointed down range. 2. Dry fire - a dry fire is when you release the bow string from full draw without an arrow. This damages the equipment and should not be done. 3. High draw - an archer should not point the bow high as they draw. With proper technique the bow should stay relatively level. 4. "Let down" - if a student is at full draw and you say to 'let down' that means to let the bow string down without letting go. This is important when doing form corrections and you need the student to start the shot over 5. Pulling Arrows - four steps to pulling arrows: one hand on target near base of arrow, other hand grabs base of arrow, most importantly check behind that it is clear, pull out arrow slowly 6. Finger Tab - this is worn on the archer's draw hand. 7. Arm Guard - this is worn on the archer's bow arm and will protect it from the string 8. Quiver - this holds the archer's arrows and is worn at the hip, typically by the dominant hand 9. Nock - be sure to hear the arrow click onto the string. It should go right underneath the nock locator with the index vane pointing towards you. 10. Hook and grip - archers should do their hook first. Two fingers go under the arrow and one goes on top. The thumb and pinky should be tucked back so that they do not get in the way. The string should basically sit in the first groove of the fingers. Remember to keep the back of the hand flat. Then do the grip. The bow hand goes into the grip with the knuckles at a 45 0 angle. The grip should press against the pressure point which is the area at the base of the thumb. The hand should be aligned so that the thumb points down range and the bow force lines up with the arm. Knowsley Approach to Gymnastics Key Stages 1 & 2 Introduction Welcome to the Knowsley approach to gymnastics for Key Stages 1 & 2. Enjoy using the scheme and make gymnastics a fun area of PE to teach.